The crocodile is a prehistoric reptile that has survived for 200 million years through several ice ages and has seen the dinosaur come and go. By 1971 crocodiles were hunted close to exctinction for their skins and their numbers had dwindled to about 3000 but nowadays they are protected and the croc population now believed to exceed 75,000. Ironically enough their protection was not a result of environmental awareness but people were being worried the might disappear as a resource. Nowadays there is no danger of extinction as their numbers have increased dramatically to the point where many people are calling for them to be culled to get the numbers down as they now often stray into territory close to people. In 2003 Territory Parks and Wildlife officers caught 180 crocodiles ranging from 2.5 to 4 metre in the 19 traps they manage around Darwin harbour. Although crocodiles are protected 600 are killed annually in the territory by licensed hunters for their skins and in March 2004 a delegation of Aborigines, politicians and tourism experts from the Northern Territory headed to Canberra to argue the case for Australia to re-introduce big-game safaris targeting the deadly saltwater crocodile, if succcesful this would see 25 of the area's largest "trophy" crocs hunted every year. Nowadays there is a thriving crocodile industry, they are farmed very successfully in farms that maintain small breeding populations, and raise the hatchlings until they reach around a meter in length. 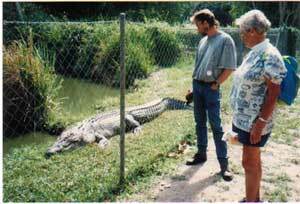 The main products of crocodile farms are leather and meat. 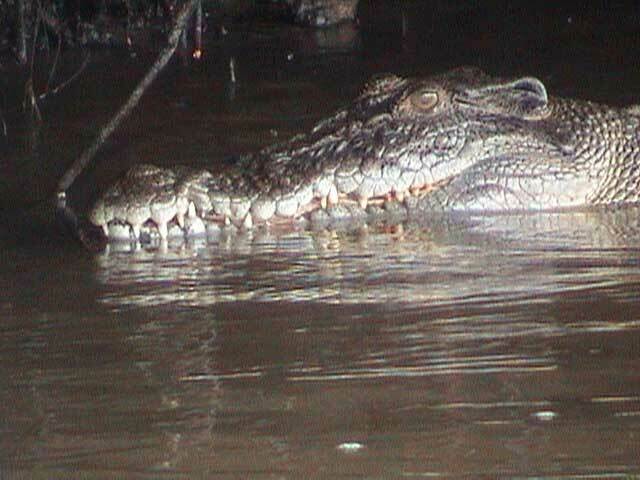 The reputation of the appetite of crocodiles was received a bit of a dent when early March 2004 the bodies of two prostitutes were found in the Adelaide River near Darwin. They had been thrown off a bridge alive but had drowned and their intact bodies were found by a boatload of croc-spotting tourists 30 hours later. Scientists are also trying to work out how crocodiles survive their injuries. In territorial disputes they often end up with horrific injuries ranging from bites and deep gashes to entire limbs ripped off, but their bodies usually heal themselves without infections. In August 2005 scientists took blood from 50 Northern Territory crocodiles to work out how it fights infections, even those resistant to known antibiotics. Some people like Mick Pitman, around the remote wilderness of the Cape York peninsula better known as Crocodile Mick, have made a career out of crocodiles. He makes a living as crocodile hunter, taxidermist and producer of crocodile products, and also specializes in crocodile capture.You can see more photos like above and read some wild adventures, on his website crocodilemick.com . Saltwater crocodiles live around the northern parts of the country, roughly north of Mackay, in waterways where, despite being called a 'salty' , they can travel hundreds of kilometres inland but they are also known to travel through the ocean and have been spotted a long way offshore. Fortunately they do not attack people in the ocean, only in inland waterways so it is still safe to swim in the ocean ( as long as it is not stinger season). 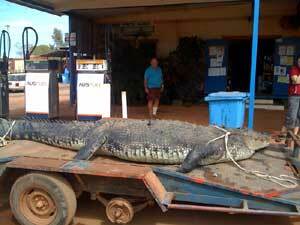 There is not many incidences of anyone having been eaten by a croc while swimming in the ocean. 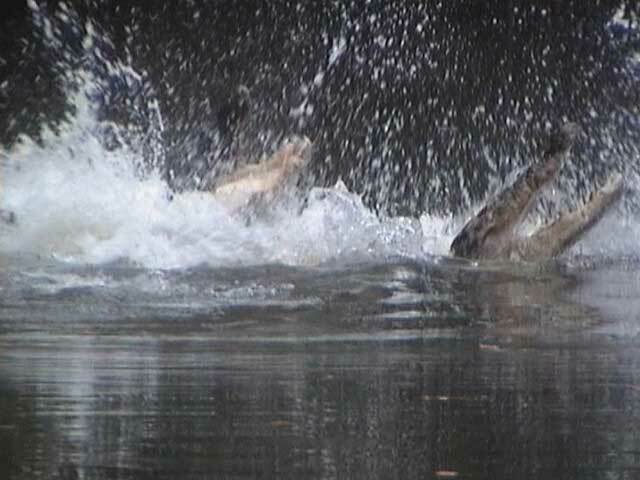 They have perfected their hunting techniques for millions of years and can swim under water at 30 km/h withhout a ripple on the surface and then burst out and on a short distance can outrun a horse. If a prey puts up too much resistance they will do the "death roll" to get it off its feet. 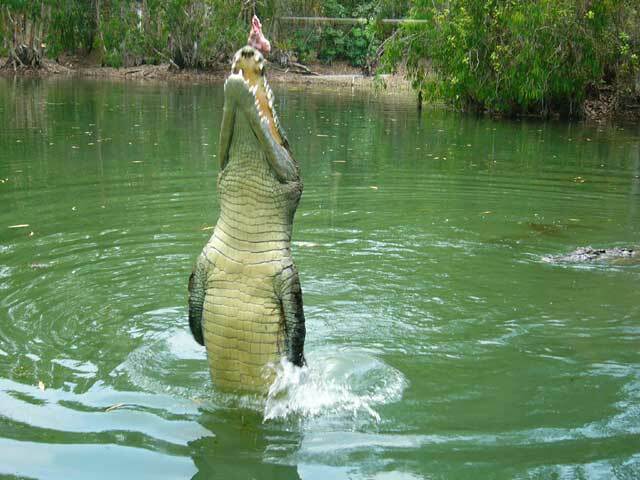 They even jump out of the water to catch low flying birds and, as you can see on the "jumping crocodile tours" in the Northern Territory raise themselves out of the water and "stand" on their tail for a few seconds to grab a piece of meat. Many crocodiles are large enough to catch and kill animals as big as cows, horses and water buffaloes, females can grow up to 4 meters in length, males can reach 7 meters in length and weigh over 1,000kg. On average one person a year in Australia is killed, usually by ignoring some of the common sense safety rules. Crocodiles are confirmed to have swum through city streets in Cairns at a king tide and in Katherine during the big flood in 1998. Salties breed in the wet season (November-March). 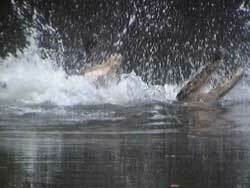 Males occupy large territories, even swimming through the ocean between rivers to breed with more females. Females will lay up to 50 eggs in a large pile of vegetation, sand and soil, usually on the banks of a river, swamp or estuary. They will hang around the nest to guard it during the three-month incubation period, and can be quite aggressive; (should you come across a big pile of vegeation on a riverbank in your explorations of Australia then get the f#%! out of there real quick). The best time to see crocodiles when you go on a boat cruise is in the dry season (winter) when the water is cold and the cold blooded reptiles come out of the water to absorb heat from sunshine. 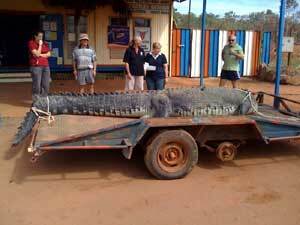 In Darwin the Territory Insurance Office offers crocodile insurance which you can take out to top up your normal travel insurance. 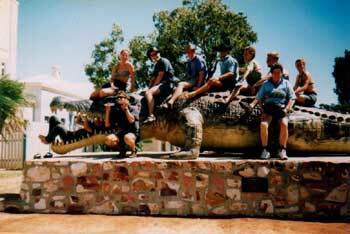 Legend has it that in the Normanton river, several kilometres from the town of Normanton, NW Queensland, there was a ginormous croc. 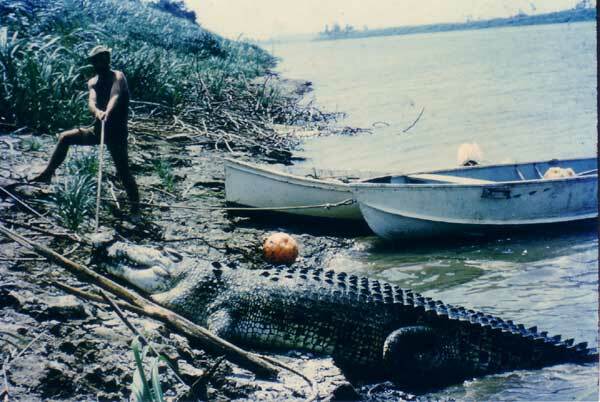 Krystina Pawloski, a woman of small build but handy with the gun, shot a crocodile measuring 8.63 metres in the Norman River in July 1958. There is an awesome replica in the main street of Normanton which the locals swear is true to size, reportedly the actual skin was used for this statue as a 'mould' to make sure of correct size and proportions, the skin is still kept in Townsville, north Queensland. Check out the size of the mouth on the picture below! 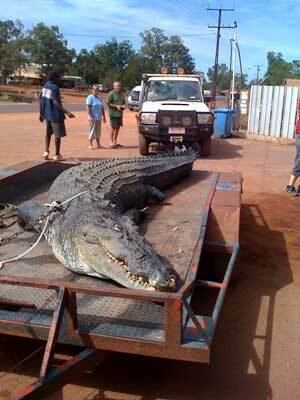 The crocodile below was shot near Borroloola in the Northern Territory when he kept on circling a fisherman's boat. It measures no less than 6.325 meters and weighed in at 1855 kilogram! It started annoying one of the local barramundi fishermen by eating the prop off his outboard. He reckons it was circling the 5 metre tinny (boat) for 20 minutes before the decision to kill it was made by him and a very frightened decky. The freshwater crocodile, (officially Johnstone’s Crocodile but usually referred to as 'freshie') lives in inland freshwater areas of Australia's northern parts and sometimes in the tidal parts of rivers. Their range does overlap with saltwater crocodiles, and they can be found in the same locality and often become dinner for the "salties'. 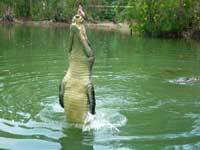 Male freshwater crocodiles grow up to 3 meters in length, females are smaller up to 2 meters. 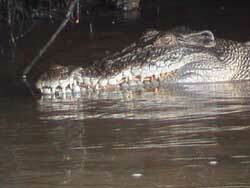 They eat all the smaller animals you find near in and rivers; insects, fish, frogs, turtles, waterbirds and snakes. Small mammals that drink at rivers are also taken. People are not on the menu as the crocs are too small but the occasional person has been bitten by a freshie if they scared them jumping on them while swimming or a woman that floated on top of one on an air mattress in Edith Falls in the Northern Territory. In the Northern Territory people swim in waterholes and waterfalls where you can actually see the freshwater crocodiles swimming around so if you want to brag to your friends back home you have swum with crocodiles in Australia then this is the place to go. They breed during the months of July and August in the dry season. Females will dig a hole in a sandy riverbank and lay up to a dozen eggs that will hatch in two to three months. The timing of hatching is the start of the wet season when food for the young (mostly insects) is abundant. The gender of the young is determined by the incubation temperature, high incubation temperature produce females, low temperatures produce males.